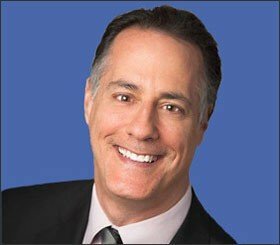 As a follow up to last week’s post and similar to the one from two weeks ago, I came across another interesting study that has some applicability for investors and ties in with some of what Lewis talked about in his book in terms of when it comes to bubbles and collective insanity taking root. The article is called In the Mind of the Market: Theory of Mind Biases Value Computation during Financial Bubbles. This is exactly what the researchers were referring to when they said that in bubble markets “profitable trading depends on accurately judging the intentions of other players in the market.” Investors are not very interested in the fundamental value of companies as the primary decision making tool when making an investment but how they anticipate other investors to behave. When bubble markets materialized in the study the order flow went from steady and orderly to being much more volatile – a lot of activity followed by lulls. The researchers looked to see if any brain regions showed signs of tracking this order flow volatility during bubble markets. Their hypothesis “was that the increased trade volume in bubble markets should be associated with an inflated representation of portfolio profits” and that certain brain regions should be more active when increased activity is detected by investors. 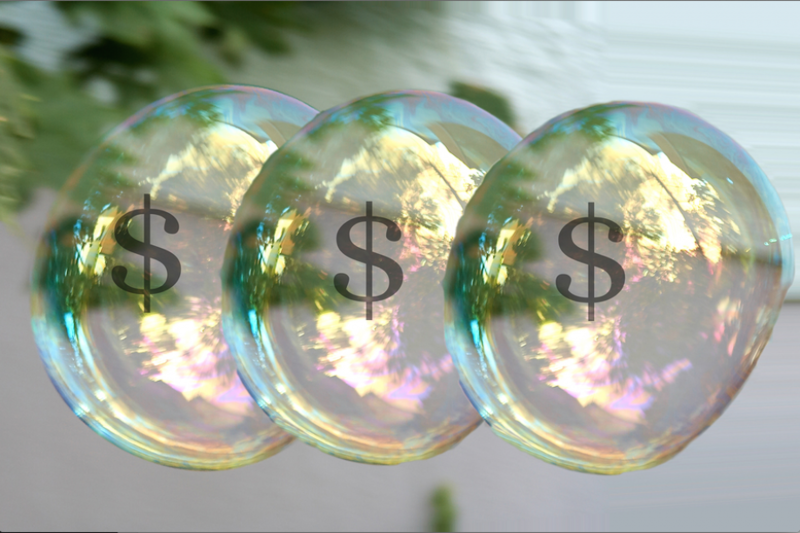 They did find heightened activity in prefrontal regions, and interpreted this as a sign “that participants are more likely to ride the bubble market, perhaps because they subconsciously believe that there are insiders with extra information operating within the market.” They also found that those who were susceptible to riding bubbles had much lower earnings solely because of trading in bubble markets. I have always been impressed by investors who not only can spot bubbles but take advantage of them profitably and then get off the mountain before the avalanche occurs. George Soros has been quite adept at this. He has been so successful because of what he articulated via the quotation at the beginning. Bubbles are built on false premises. People can get sucked in to them and drive prices to irrational levels but then have utter disgust and fear when it turns out that the premise for the investment was wrong. The researchers believe that much of this has to do with neurological reactions which leads to anticipatory behavior whereas Soros may be asserting that the most powerful bubbles are built on a false premise. I’m willing to accept both as someone who is always trying to capitalize on bubbles in some form or fashion. There are apparently strong neurological reasons why they can form and perpetuate whereas Soros’ real world experience and incredible track record leads me to believe that it is highly advantageous to see where the premises are false. Turning back to the previous post that focused a lot on what was going on the 1920, there was a belief then that incredible value could be created through financial engineering versus building businesses focused on generating recurring and durable profit streams. Incredible money was made in short periods of time just announcing that a new holding company or trust was being formed. Leverage was piled on top of leverage. The way to wealth was based on a false premise like Soros states. The same was true in the subprime bubble where it was believed that taking less than AAA pieces of paper and bundling them up could miraculously create AAA paper. Especially when the securities were backed by mortgages which were based on borrowers lying about their income and buying way more home than they could afford. This was utterly false and led to a collapse in the value of these securities as the housing market cratered once lending tightened up. A more recent example is the tremendous rally in gold that saw the GOLD ETF more than double in approximately two years. 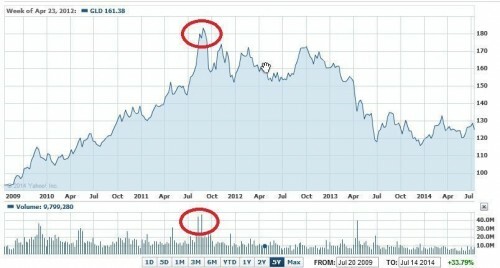 The following graph shows the big run up and then significant correction. Similar to the research cited earlier there was a tremendous increase in trading volume as the price hit a blow off top as the red circles show. Since then it has corrected by about 30%. The run up was based on the false premise that the Fed’s quantitative easing programs would lead to a much higher rate of inflation due to the perception that the Fed was printing money. All the Fed was doing was taking interest income out of the economy (deflationary) by buying longer-dated, interest bearing Treasuries with cash generating minimal interest income. The activity has served to inflate asset markets but not consumer prices by and large. According to Soros such a false premise, which was quite understandable as to why it was so widely accepted, is a perfect wave to ride because it can go quite high. It is important for the investor to know when to exit, however. And this is when the confirming evidence does not materialize and investors have to start questioning whether they’re exposing themselves to too much risk and it’s time to exit. In the gold example, many came to realize that they were making buying decisions as much based on riding the wave and anticipating the behavior of others as a belief in the fundamental value of gold in a perceived inflationary policy environment. Once the latter became discredited or continuously unsubstantiated, then one is just left with the former, which is not a comfortable place to be situated. Conversely, it’s also important to look for opportunities where the premises are solid but the consensus doesn’t believe it to be the case or doesn’t have strong convictions regarding them being true. We found that to some degree in the apartment market where people were skeptical that the markets would remain strong once construction started to materialize again. We believed that people were underestimating how strong the demand would be for new communities and that apartments would continue to capture a very large percentage of household formations. To date our assertion seems to be holding up as occupancies remain strong and rents continue to grow. One area in particular that is holding up quite well in the face of a lot of new supply is Austin. Our portfolio performance is very solid as job growth and household formations have been sufficient to absorb the new supply without impacting occupancy and rents. So what’s my conclusion? Check your premises at the door!